Our journey has taken us from the deep sea (~4200 m ocean depth) to the continental shelf (~250 m ocean depth), and we’ve arrived at our final drilling site on the continental slope. We have collected a wealth of sediments from this transect in the Gulf of Alaska that will provide a high resolution record of climate, sedimentation, and the Earth’s geomagnetic field, and it’s all gone incredibly smoothly thanks to our fearless leaders. Shown in the image on the left, co-chief scienitsts Dr. Sean Gulick (University of Texas, Institute for Geophysics) and Dr. John Jaeger (University of Florida, Dept. 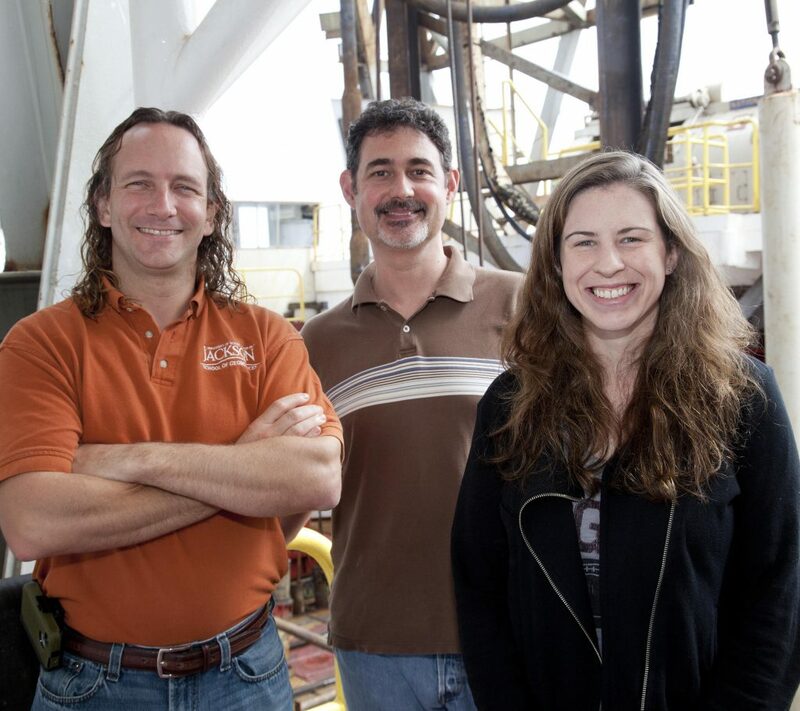 of Geological Sciences), and Expedition Project Manager Dr. Leah Schneider (IODP, Texas A&M University) are displaying their authentic smiles. Don’t they look like superheroes? They are a leadership team to be reckoned with. The enthusiasm of our co-chief scientists, Sean and John, hasn’t wavered a bit while we’ve been at sea. They are the scientific navigators of this operation and have had to make a lot of decisions to ensure that the scientific objectives will be met. It’s the ultimate game of strategy, really. Weighing the drilling options, deciding when to pull out of a hole, making decisions about the course of the expedition as the clock is ticking, and all the while making sure that the scientists will have the sediments they need to do their research. It’s a lot of pressure, and through it all they have remained calm, collected, and continuously excited. Sean and John eagerly await each core’s arrival on the catwalk, spend a lot of time engaged in scientific discussions in the labs, and are always willing to lend a hand towards our education efforts. They have been planning this expedition for several years and have brilliantly executed it. Being at sea for 60 days is a challenge for everyone involved, especially now that we’ve spent over 50 days at sea, everyone is tired, and there is still a lot of work to be done. We’re at a critical time in the expedition: we’re busy retrieving cores at our last site which means there’s a lot of analysis that needs to be done, scientists are busy finishing reports, and the co-chiefs are busy reviewing and writing reports. It’s a sprint to the finish line. The scientists are working long days every day and good leadership is really key to ensuring that everything runs smoothly and people remain happy (or deliriously happy, as the case may be). I think I can safely say that everyone on Expedition 341 appreciates the leadership of our co-chiefs and expedition project manager and would sail with them again in a heartbeat. I think this is a good lesson in life, because no matter where you work or what you do you’re a part of a team. Take it from our co-chiefs: Being enthusiastic about your work rubs off on those around you.